I love cookies but they are not good for me. I have discovered a way to make cookies healthy and also taste good. These cookies are great for breakfast as they are loaded with nutritional foods like whole grains, fruit and nuts. I also added coconut flour which adds fiber and protein and a hint of coconut flavor. I can indulge in cookies with my coffee and not feel guilty. 1) Lightly grease two baking sheets, or line them with parchment or silicone baking sheets. 2) In a large bowl, soften the butter and brown sugar together until fluffy. Add milk, egg, vanilla, cinnamon, baking soda, and salt. Stir until well mixed. 3) Mix in the wheat flour, coconut flour, oatmeal, and flax meal. Stir until well combined. Add the dried cranberries and sunflower seeds, mix well. 4) Let the dough rest for 30 minutes or so at room temperature, for the oats to soften. Towards the end of the rest period, preheat the oven to 350°F. 5) Scoop the dough by rounded tablespoonfuls onto the prepared baking sheets. Flatten each ball of dough slightly. 6) Bake the cookies for 15 to 20 minutes, until golden brown. Cool them on the baking sheets for 15 minutes or so, to allow them to set. These look so good! I have been trying to eat healthy and these came at the perfect time! Thank you for sharing! Very interesting! I try to eat oatmeal every morning but some days I just don't have time to make it and end up grabbing a protein bar instead. This would be a great alternative. And I loooove cranberries. Oh yummy! That would be a great grab and go breakfast! I love cranberries! Thanks for the recipe! I need to make some breakfast cookies. My kids would love to have cookies for breakfast. Cookies for breakfast. Now that is sure to get the kids out of bed. I have yet to try coconut flour, but this sounds like a great recipe to try for the first time. I think I'd like the subtle coconut flavor! Oh I love the idea of cookies for breakfast! These look filling too. I bet these are great, I love working with coconut flour. Yum! Yum! I've been meaning to make something like this! I need something quick to have on hand and you can't beat cookies! Pinning! 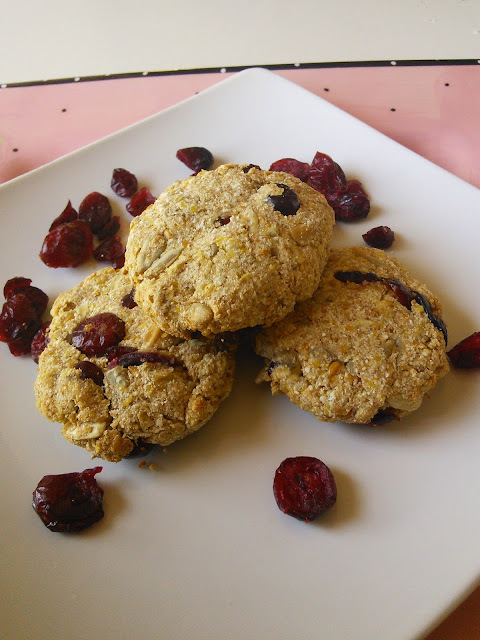 I love the taste of coconut flour and have made tasty treats with it. These look good! These look delicious. They would make a great pairing with my morning tea. Those cookies look really yummy! And I am all for ways to make things healthier! These cookies look so tasty, and would be a great breakfast! Mmmm! Tasty! I don't eat flour very often (cuz of the carbs) so these look like a great alternative to their more gluten-y cousin ;) Thanks! Yum, I love cranberries! Will have to try this one out! How delectable! 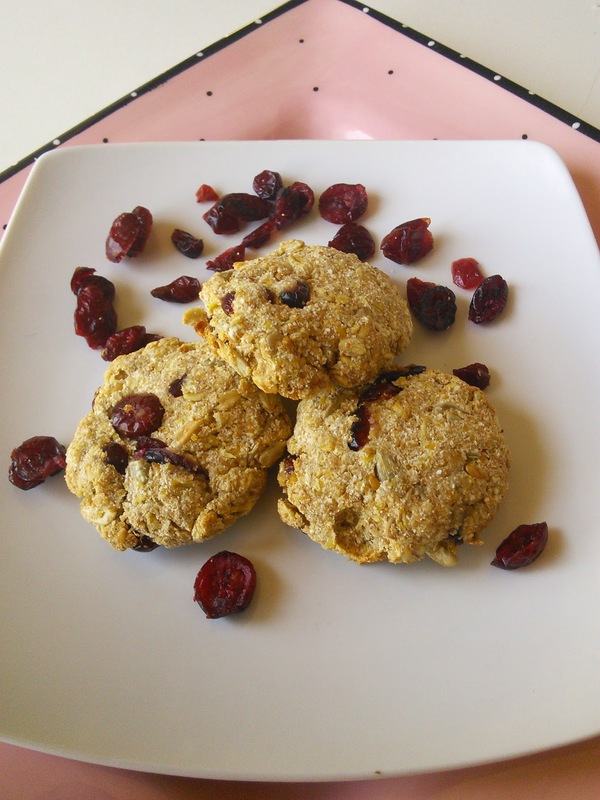 I am delighted that you shared your healthy and delicious Oatmeal Cranberry Breakfast Cookies recipe with us on the Plant-Based Potluck Party Link Up. I appreciate it and I can't wait to try your recipe. I'm pinning and sharing.